Adopted on November 16, 1971. The mourning dove, (Zenaidura macroura corolinensis linnaus,) was adopted as the state symbol of peace by individuals and organizations concerned with conservation and wildlife, the mourning dove was added to Section 1.10 of the statutes as Wisconsin's official symbol of peace and removed from the statutory definition of game birds by Chapter 129, Laws of 1971. It was adopted on November 16,1971. A graceful, slender-tailed, small-headed dove that's common across the continent. Mourning Doves perch on telephone wires and forage for seeds on the ground; their flight is fast and bullet straight. Their soft, drawn-out calls sound like laments. When taking off, their wings make a sharp whistling or whinnying. Mourning Doves are the most frequently hunted species in North America. The reason for concern came from the fact that the mourning dove has long been the most popular game bird in North America (now only legal in 38 states, as well as Canada and Mexico). The debate regarding this issue lasted over a decade and in 1971 the mourning dove was removed from the game bird listing. 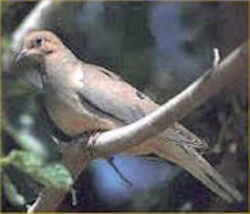 The mourning dove is well named because its song is certainly suggestive of sadness. It is a sweet sadness though that has a genuine appeal when heard from a distance early on a summer morning. The dove belongs to the pigeon family and looks just like an undersized grayish blue refugee from a pigeon cote. The sleek flyer is a favorite game bird throughout the Southern states. His flight is so swift and erratic that average hunters are pleased to collect one bird for every four shots. Despite the size, the flesh of the dove is delicious especially when served with wild rice. 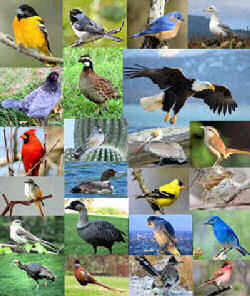 These birds are medium sized, brownish, and with a rounded or pointed, white tipped tail. The males are larger than the females and are slightly brighter colored. Mourning doves eat a wide variety of seeds, waste grain, fruit and insects. They prefer seeds that rest on the ground. Occasionally, they eat in trees and bushes when the ground foods have become scarce. 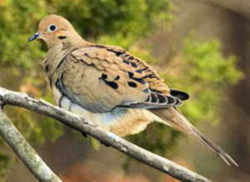 95% of the mourning dove's diet relies on seeds or plant parts. Doves also like to ingest agricultural crops. Those especially coveted are cereal grains such as corn, millet, rye, barley, and oats. On rare occasions, doves can also be seen preying on grasshoppers, ants, beetles, and snails. Mourning doves are monogamous. Furthermore, some of these pairs stay on as couples thru the winter. After finding a mate, the male imitates the nest selection site. Nest construction takes over ten hours and covers a span of three to four days. The female generally lay two small, white eggs in an open nest. Incubation lasts 14 to 15 days. Both the male and the female share incubating and the feeding of the babies. Mourning doves have the longest breeding season of all North American birds. They can often have three broods in one season. Two much-studied behaviors of mourning doves are their monogamous mating and their widespread migration patterns. Migration originates in the breeding grounds and continues to the southern areas where the doves go to escape the harsh winter months. 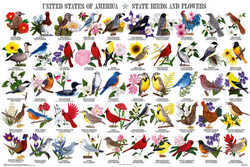 During migration the birds fly over 1000 of miles through hostile environment to reach their winter resting spot. Long pointed tail is distinctive for adults, while black spotting on coverts and pale color help distinguish it from White-winged and White-tipped Doves. Juvenile is easily confused with Common Ground-Dove and Inca Dove, but is longer necked, shows a pointed tail with more white at edges and lacks cinnamon in primaries. is the symbol of peace.